Author(s): Elka Popova. Department of Physiology, Medical Phaculty, Medical University, 1431 Sofia, Country Bulgaria. In the vertebrate retina, visual signals are segregated into parallel ON and OFF pathways, which provide information for light increments and decrements. The segregation is first evident at the level of the ON and OFF bipolar cells and it apparently remains as signals propagate to higher brain visual centers. A fundamental question in visual neuroscience is how these two parallel pathways function: are they independent from each other or do they interact somehow? In the latter case, what kinds of mechanisms are involved and what are the consequences from this cross-talk? This review summarizes current knowledge about the types of interactions between the ON and OFF channels in nonmammalian and mammalian retina. Data concerning the ON-OFF interactions in distal retina revealed by recording of single bipolar cell activity and electroretinographic ON (b-wave) and OFF (d-wave) responses are presented. Special emphasis is put on the ON-OFF interactions in proximal retina and their dependence on the state of light adaptation in mammalian retina. The involvement of the GABAergic and glycinergic systems in the ON-OFF crosstalk is also discussed. 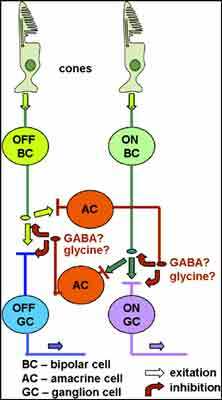 Keywords: Bipolar cells, electroretinogram, GABA, ganglion cells, glycine, ON-OFF interactions, retina. Affiliation:Department of Physiology, Medical Phaculty, Medical University, 1431 Sofia, Country Bulgaria. Keywords:Bipolar cells, electroretinogram, GABA, ganglion cells, glycine, ON-OFF interactions, retina. Abstract:In the vertebrate retina, visual signals are segregated into parallel ON and OFF pathways, which provide information for light increments and decrements. The segregation is first evident at the level of the ON and OFF bipolar cells and it apparently remains as signals propagate to higher brain visual centers. A fundamental question in visual neuroscience is how these two parallel pathways function: are they independent from each other or do they interact somehow? In the latter case, what kinds of mechanisms are involved and what are the consequences from this cross-talk? This review summarizes current knowledge about the types of interactions between the ON and OFF channels in nonmammalian and mammalian retina. Data concerning the ON-OFF interactions in distal retina revealed by recording of single bipolar cell activity and electroretinographic ON (b-wave) and OFF (d-wave) responses are presented. Special emphasis is put on the ON-OFF interactions in proximal retina and their dependence on the state of light adaptation in mammalian retina. The involvement of the GABAergic and glycinergic systems in the ON-OFF crosstalk is also discussed.